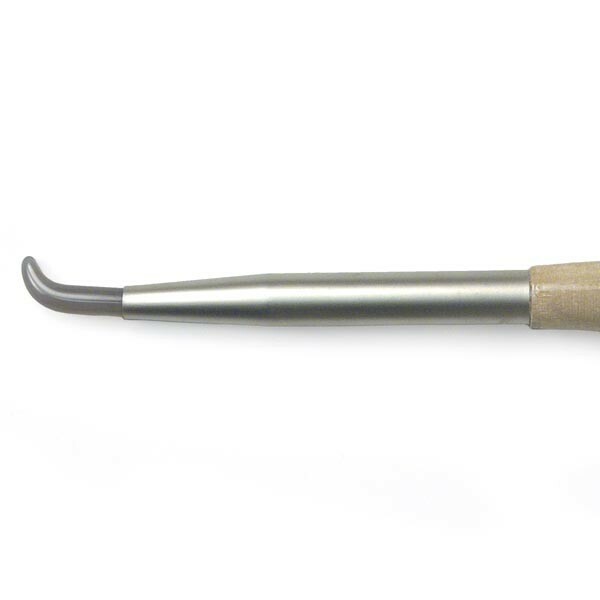 Details This professional "dog tooth" shaped burnisher with polished genuine agate head, set securely in a wooden handle, is used for burnishing gold leaf. Agate is a natural stone, consisting of a form of silica, similar to chalcedony, with colored bands of purple, pink or brown, shaped and polished for use as a burnishing tool, particularly in edge gilding of books, raised gilding in manuscripts, and gilding in paintings and on picture frames. Burnishers are tools used to impart a mirror-like polish to gold and other metal leaf. They are made of metal, agate (quartz), psilomelanite or hematite set in handles. The hematite type is the best and also the most expensive. Burnishers are generally available in variety of shapes, but there are three basic shapes--flat, toothed and pencil. They are relatively delicate tools and chip easily if handled roughly; they may be kept smooth and in good condition by rubbing them on the flesh side of a piece of leather coated with whiting, or, if too rough to be smoothed in this manner, by rubbing them on a zinc-lined board coated with a small amount of flour or emery mixed with machine oil. Hematite (a high-grade iron ore) is the ideal burnisher. Hematite looks black, but is actually red and commonly called bloodstone. It remains dry even in humid conditions, and skates over the gold while creating a brilliant polish. It disperses static so gold does not readily stick to it. Psilomelanite is widely used because it has comparatively few flaws and is less wasteful in manufacture than hematite. Its color is essentially black. They must be kept scrupulously clean of grease -- no touching with your fingers! Agate (a semi-precious stone) is widely available as a polishing stone but it has the single disadvantage of absorbing moisture from the atmosphere. Pencil and dog-tooth burnishers made of agate are perfectly adequate for almost all gilding projects. A dog tooth burnisher (No. 17 is a reasonable size) is sufficient to start with and perhaps a pencil burnisher (No. 8). The hematite burnisher is a very versatile tool particularly for raised gilding. Tips: Always store the burnisher in a soft cloth or felt pouch (not supplied) and never put it into your pencil box or leave it lying on the desk -- the smallest of scratches will gradually build up and cause the burnisher to "pull." Cleanliness is vital -- nearly everybody wants to "feel" the smooth stone and leave an invisible layer of grease with their fingers -- don't let anyone touch it! Before working breathe on the burnisher and polish it with a piece of silk. Burnish with slow, moderately applied pressure, using strokes about 2 cm (an inch) wide. The correct amount of pressure comes with practice and experience. Too little pressure will not yield a high sheen. Too much pressure will rub off the leaf.